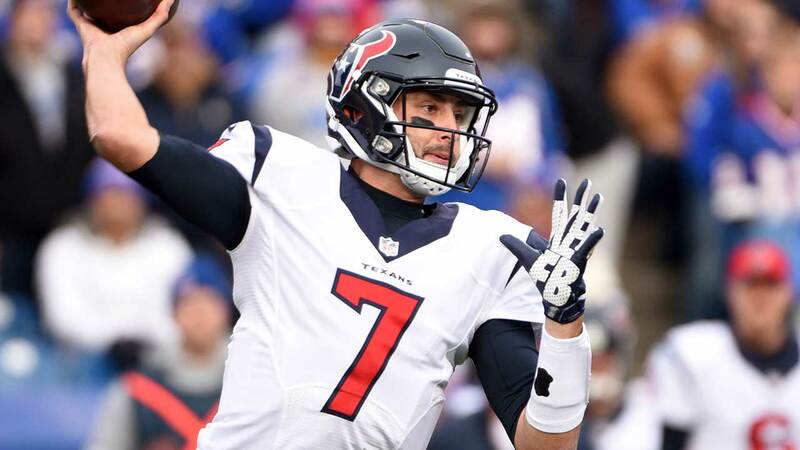 HOUSTON -- Houston quarterback Brian Hoyer is out of the NFL's concussion protocol and will start on Sunday against Jacksonville. Hoyer missed the last two games after suffering his second concussion in less than a month on Dec. 13. Coach Bill O'Brien said that he was cleared by doctors on Wednesday and that he'll lead the Texans when they try to clinch their first AFC South title since 2012. Hoyer was cleared to practice last week, but was not allowed to play. "I thought he practiced really well last week ... he ran the (scout) team, did some things on the side and (Wednesday) I thought he looked really sharp," O'Brien said. "Again, it all depends on how it looks on Sunday obviously, but I think he's looked good, he's got good command of our offense and what we're doing, and the ball seems like it's coming out of his hand real well." Hoyer missed one game after getting his first concussion this season on Nov. 16. He received his second one in his third game back when he was sacked five times in a loss to the Patriots. "I think for me, I didn't take it lightly," Hoyer said. "I saw several medical professionals, not only just the doctors here but other ones and did a lot of research, talked to a lot of people, and I feel great, no reservations or anything like that. I'm ready to go play and play like I always do." T.J. Yates started the first game after Hoyer was injured, but tore an ACL in the second quarter. He was replaced by Brandon Weeden, who led Houston to a win over Indianapolis in that game and also helped Houston to a win over Tennessee on Sunday in his first start for the team. Hoyer said it's been difficult watching other guys do his job the last couple of weeks. "(They) have done a great job of keeping us in it and getting us to this point, so I applaud them and really just thank them for keeping it going while I had to deal with this concussion stuff," he said. "(But) ... you just never want to see someone else doing your job, regardless of the situation. For me, it's just exciting to get back out there, be in that huddle, get things going again and really just be a part of the team." Hoyer has thrown for 2,357 yards with 18 touchdowns and six interceptions this season. Receiver DeAndre Hopkins is glad to get Hoyer back this week and knows what to expect from the quarterback. "I know what I am going to get from him; a guy that is going to go out there and give us his all," Hopkins said. Weeden will back Hoyer up on Sunday.